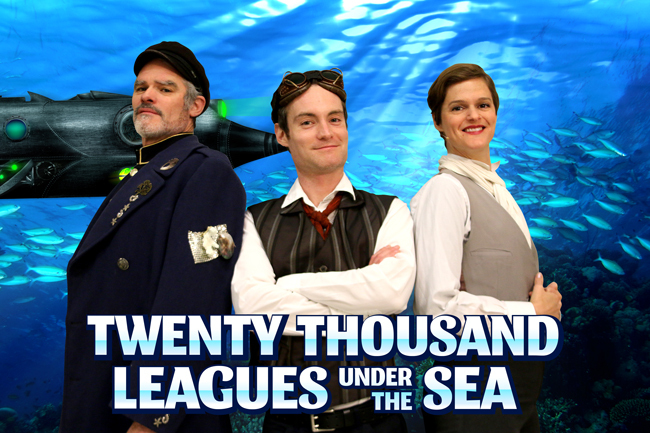 We caught up with Rick Miller and Craig Francis, the Creators of Twenty Thousand Leagues Under The Sea and asked them about the show. Q: Many children dream of detaching themselves from civilization and living a rogue lifestyle. Do you think this is part of Twenty Thousand Leagues continued popularity? RICK MILLER (RM): I think it’s universal that humans (especially children) want to escape from life, from parents, from society when things are overwhelming. In Twenty Thousand Leagues Under The Sea, Jules Verne introduces us to the brilliant anti-hero Captain Nemo. Nemo represents complete disconnection, and a kind of utopian dream of freedom from the oppression of humankind. So yes, I think this is part of the continuing popularity of the story: as we’re taken aboard Nemo’s Nautilus submarine as passengers, and we marvel at his lifestyle and his technological innovations. But Verne cleverly makes us realize that complete disconnection comes at a cost, and we become prisoners of a monster of our own making. CRAIG FRANCIS (CF): Young people are trying to find their place in a complex world. The stage versions of classics we create at Kidoons have a strong theme of disconnection: in our Jungle Book, Mowgli is disconnected from humanity as he’s raised in the jungle, but he is also cast out of the jungle for not being an animal. In Frankenstein, the Creature is completely disconnected – he is not human, and has not a single person who can relate to him. Because our plays are multimedia, we love to explore the role technology plays in our lives. Our character Jules says that technology can “connect or disconnect us” – the phones in our pockets can bring us together or drive us apart – and this is explored throughout the play. How did Jules Verne’s book anticipate the ecology movement? What do you think Verne would think of the world in its current state? CF: I loved the book when I was a kid: Jules Verne took what was cutting-edge technology in his age (electricity, trying to travel underwater), and saw where it was going. Re-reading it, what I found relevant and shocking is what we’ve done to the world’s oceans in the 150 years between when the novel was written and today. Darwin’s “Origin of Species” was new when Jules Verne was writing Twenty Thousand Leagues Under The Sea, but we thought how ironic it is that all these undersea species that were just being discovered, are now being threatened with extinction. The book does not anticipate the ecology movement, because at the time it was thought the oceans could be exploited endlessly: sadly, Jules Verne underestimated humankind’s rapaciousness. He didn’t foresee that we’d make the same mistakes in the oceans that we had made on land. That’s part of why the character Jules is so depressed when we first meet him. RM: One of the hooks that drew us in was that back then Captain Nemo was so distraught by what was happening on land that he escaped and created a paradise under the sea, a utopia. Nowadays, that utopia’s been made less utopic by human activity and depleting ocean ecosystems. That’s our framework, our jumping off point for the piece. But in the end, we bring it home with a sense of hope, and a call to action. How is current technology integrated into the show? What ways are you encouraging viewers to let technology be apart of their experience? RM: Twenty Thousand Leagues Under The Sea, like all our Kidoons stage shows, uses multimedia in creative, immersive ways, while also commenting on technology itself, and how we use it today. I love working with cameras and media, especially in plays where you can question and challenge them. Video allows you to jump in scale from an action figure, to a live person, to a small submarine in the depths of the entire ocean. We also have our main character (Jules, from the present day) jumping back in time with his smartphone. What does that mean – running into history with video? Captain Nemo ends up becoming even darker because he uses the power of the phone for surveillance. CF: Our projection designer Deco Dawson and our composer Richard Feren are both brilliant, and specialize in retro ambient film and sound. Initially, I had thought it might look and sound like a really old black and white movie, but when you see the finished play it’s actually hyper-colourful, and feels like a storybook or video game. Either of those things is equally applicable to the source material of Jules Verne, and I was overjoyed with how exciting this play ended up looking and sounding. That’s the magic thrill you get with theatre, unlike movies: actors working with light, sound, and video artists, and each other, in real time with a live audience. What message are you hoping that young viewers take away from seeing this play? CF: For those who love Jules Verne’s book (or the movies), it’s a fast-paced, super-fun retelling of the classic undersea adventure with a terrific cast of actors. It’s also about creativity: you get the feeling that maybe Jules has told this whole story in his room using his phone camera, puppets, and action figures. At the same time, it will hopefully make you think differently about how water plays a part in our lives. If a kid sees this show and decides to become an actor, or become a designer, or become a scientist, I’d be thrilled to have helped inspire them. RM: I read the novel in French because I grew up in Montreal. I loved Jules Verne, I loved that he was at the intersection of art and science, and I was really interested in both. Everything we’ve done surrounding this production – whether it’s the outreach or the Nautilus Leaks videos we’ve made on our Kidoons Network – all touch on creative storytelling in art and science. Not just the creativity of the author, but of the character that he invented. Captain Nemo is a brilliant creator, possessed with a madness that comes from being completely disconnected from society, but we hope audiences come out of this more connected with the people doing great work in water today.